The Treasurer, the Hon Josh Frydenberg MP handed down his first Federal Budget on Tuesday 2 April 2019, announcing a $7.1 billion surplus. There are tax cuts for individuals earning up to $126,000 p.a. and business with annual turnover up to $50M. Personal tax cuts will be delivered largely through an immediate substantial increase to the so-called low and middle-income tax offset to $1,080 for singles; and $2,160 for couples. This offset will apply for four income years commencing in 2018-19. The full tax benefit of $1,080 will flow straight to singles earning between $48,000 and $90,000 p.a. (around 4.5 million taxpayers). Lesser amounts will apply at other levels up to $126,000 p.a. From 2024-25, the 32.5% marginal tax rate will be reduced to 30%, from 2022-23 the 19% bracket will cut in at $45,000 rather than $41,000, and from 2022-23 the low-income tax offset will be increased from $645 to $700. Small and medium business tax cuts will reduce the company tax rate to 25% from 2021-22 and increase the instant asset write-off to $30,000 for assets acquired after 7.30pm on 2 April 2019. 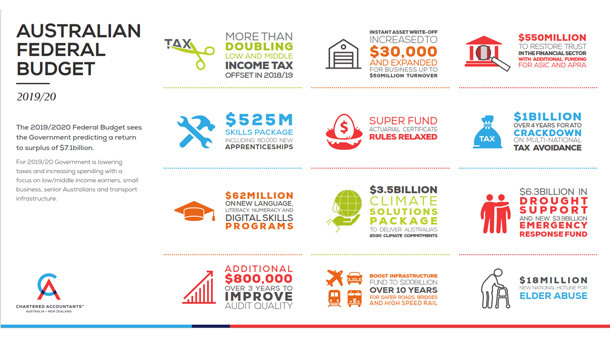 These measures will only apply to business around turnovers of less than $50 million. The instant asset write-off applies on a per asset basis so eligible business can instantly write off multiple assets. From 1 July 2020, voluntary superannuation contributions (both concessional and non- concessional) will be able to be made by those aged 65 and 66 without meeting the work test. People aged 65 and 66 will also be able to make up to 3 years of non-concessional contributions under the bring forward rule. This broadly aligns the work test with the eligibility age for the age pension. The increase in the age limit for spouse contributions to 74 to give older Australians greater flexibility to save for retirement. A deferral of the start date for the so called "Division 7A Integrity Rule" from 1 July 2019 to 1 July 2020. This is designed to allow for further consultation and to ensure appropriate transitional arrangements so taxpayers are not unfairly prejudiced. Call us at Robert Goodman Accountants on 07 3289 1700 or email us at reception@rgoodman.com.au. © Copyright 2019. All rights reserved. Source: Thomson Reuters. Additional thanks to the Tax Institute and CAANZ. Brought to you by Robert Goodman Accountants. 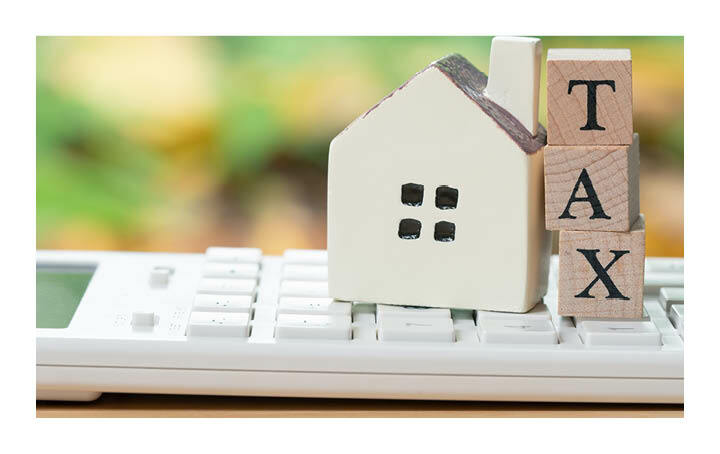 Many homeowners are not aware that the "main residence" rules exempting the family home from capital gains tax (CGT) are in fact quite complex and contain many traps. Here we highlight three common scenarios in which a homeowner may face some CGT liability when it is time to sell. 3. Moving home: When buying a new home and selling your old one, you generally have a six-month grace period in which both the old and new homes are treated as your main residence. However, if you are unable to sell your old home within six months of purchasing the new property, the main residence exemption only applies to both homes for the six months before you dispose of the old home. There will be an "excess" period beyond the six-month window that creates a CGT liability. Call us at Robert Goodman Accountants on 07 3289 1700 or email us at reception@rgoodman.com.au. © Copyright 2019. All rights reserved. Source: Thomson Reuters. Brought to you by Robert Goodman Accountants. Have you ever taken home an item of your business' trading stock for your own personal use, or use by your family members? This is common in many businesses such as bakeries, butchers and cafés, but it does have some tax consequences. "Trading stock" means anything that you hold in the business for the purposes of manufacture, sale or exchange. An example is a café owner who consumes some of the food on hand in their café. If you use any trading stock for personal use, you need to declare this in your business' tax return. This is because you are treated as if you sold the trading stock to someone else, and the value of that stock is therefore assessable income. Example: Susan runs a takeaway business and often brings home various food items for her family to eat. It is not always practical to record the value of every item she brings home. Her family includes herself, her husband and child aged 11 years. When preparing her business' tax return, she uses the ATO estimates for takeaway shops for two adults (2 x $3,430) and one child (1 x $1,715), a total of $8,575. She declares this as assessable income in her return. Alternatively, a business may declare the actual value of goods taken from stock. This option would suit businesses who can show that they took a lesser amount for personal use than the ATO's estimates. This option requires thorough record-keeping as you will need to keep details of the date; a description of what was taken; why it was taken; and the value of the item (excl. GST). Millions of Australians are now using the "sharing" economy to earn some extra money on the side. Thanks to smartphones and user-friendly app technology, people young and old are using peer-to-peer digital platforms to access sharing services like ride sharing, accommodation sharing, "odd jobs" networks and even pet minding. In this instalment of our ongoing series on the sharing economy, we focus on your tax obligations when earning money from a short-term residential accommodation sharing platform such as Airbnb or Stayz. The income you earn from accommodation sharing platforms is assessable income that you must declare in your tax return. The ATO does not consider this to be "hobby" income, even if you only share your property occasionally. As with all rental properties, earning money through accommodation sharing sites requires careful record-keeping and documentary proof. Talk to us today to make sure you are claiming all available deductions or to discuss how your main residence might be affected for CGT purposes. One of the key investment rules that SMSF trustees must be familiar with are the laws restricting "non-arm's length" dealings. In essence, SMSFs are prohibited from dealing with a related party of the fund on uncommercial terms and, where these terms are too favourable to the SMSF, hefty tax penalties can apply. Proposed laws before Parliament are set to tighten these rules further, so now is a good time for SMSF trustees to ensure they understand this area. What is non-arm's length income? Any dealing between an SMSF trustee and a related party (such as a member or member's relative, or a trust or company the member controls) must be on "arm's length" terms. This means SMSFs cannot enter into transactions that are less or more favourable to the SMSF than commercial transactions. Importantly, where an SMSF is not dealing at arm's length with the other party and it earns more income than it might have been expected to earn under an arm's length arrangement, all of the income from the arrangement – not just the excessive component – is taxed at a penalty rate of 45%. Bob's SMSF owns a commercial property that it leases to Bob's manufacturing business. The parties sign a lease with rent set at $1,200 per week, even though the market rate of rent for comparable commercial premises in the area is around $800 per week. This results in the SMSF earning more rental income than it would under an arm's length arrangement. All of the SMSF's rental income – not just the amount by which it exceeds the market rate – will be taxed at 45%. Proposed amendments before Parliament will expand this regime so that income received by an SMSF that has not been dealing at arm's length will also be taxed as NALI if, in gaining or producing the income, the fund has either not incurred a loss or expense that it might have been expected to incur if the parties had been dealing at arm's length, or incurred a loss or expense that is less than the amount it might have been expected to incur. One specific scenario that the amendments aim to capture is property acquired under a limited recourse borrowing arrangement where the rental income earned by the SMSF is at market rates, but the interest expenses paid by the SMSF to a related party lender are less than market rates. Under the proposed new laws, the rental income would be taxed as NALI because, even though it is at market rates, it is earned in connection with a scheme where the SMSF has not incurred arm's length expenses. The new laws also clarify that the NALI measures apply to capital expenditure. For example, where an SMSF acquires an asset below market value, not only will the rental income be taxed as NALI, but also the capital gain that results when the SMSF later disposes of the asset. The key to ensuring your SMSF does not fall foul of the NALI rules is to seek advice before entering into any arrangements with related parties. Contact us today if you are thinking about an investment opportunity for your SMSF that may involve a related party. © Copyright 2019. All rights reserved. Source: Thomson Reuters. IMPORTANT: This communication is factual only and does not constitute financial advice. Please consult a licensed financial planner for advice tailored to your financial circumstances. Brought to you by Robert Goodman Accountants. For many Australians, the control and flexibility offered by an SMSF makes this an attractive option for managing their superannuation. However, being an SMSF trustee carries significant responsibilities. In a case last year (Hart and Commissioner of Taxation), the Administrative Appeals Tribunal underlined the consequences that can flow when SMSF trustees do not take their responsibilities seriously. the transfer of the couple's "hobby farm" into the SMSF that was, among many issues, not correctly registered in the name of the trustees and not transferred at market value. These actions involved serious alleged breaches of numerous superannuation laws. Ultimately, the Commissioner exercised his power to disqualify the husband from being a trustee of a superannuation fund. The husband applied to the Tribunal for a review of the Commissioner's decision. By law, the Commissioner may disqualify a person if either the number or seriousness of the person's contraventions of superannuation law justifies their disqualification or the person is not a "fit and proper person" to be a trustee. The Tribunal said the first ground was met because it was "abundantly clear" the husband had breached superannuation laws numerous times and the breaches were "extremely serious". The Tribunal also found that the husband unquestionably failed the alternative "fit and proper person" test. Notably, the Tribunal had observed that the husband gave "less than satisfactory" answers and tried to deflect responsibility or confuse the issues. They also noted that he was not candid when dealing with the ATO.and that there was a "serious suspicion" that he had falsified signatures on documents. The Tribunal therefore affirmed the Commissioner's decision to disqualify the husband from acting as an SMSF trustee again. This decision highlights the importance of honesty and cooperation when dealing with the ATO during an audit, and also that the ATO and courts will not look favourably upon SMSF trustees whose ignorance of the law and behaviour indicate they are not a "fit and proper person" to be a trustee. In order to hold benefits in an SMSF, you must be prepared to genuinely undertake trusteeship of the fund. Contact our office if you are considering establishing an SMSF and need more information about the duties and responsibilities of SMSF trustees. The SMSs and emails sometimes ask the recipient to click on a link and provide their personal details in order to obtain an alleged "refund" from the ATO. Alternatively, the scammers may ask the taxpayer to pay a fake tax debt. The ATO warns Australians that these scammers intend to steal not only your money, but also sometimes your identity via your personal information. The risk of falling victim to a "spoofing" scam is even greater considering that some scammers hold enough personal information about the targeted taxpayer to appear genuine. If you have made a payment to someone you later suspect is a scammer, you should report this to the ATO; contact your bank or financial institution; make a formal police report; and report the scam to SCAMwatch or the Australian Cybercrime Online Reporting Network (ACORN). Beware of tax scams. Never pay an alleged tax debt without first talking to your tax agent. The write-off is a temporary measure that allows small businesses to claim an immediate deduction for certain capital expenditures, rather than having to deduct these costs over time. This "accelerated" depreciation deduction improves small businesses' cashflow and encourages them to reinvest amounts back into their business. Under current arrangements, small businesses with an aggregated annual turnover under $10 million, may claim an "instant" deduction (ie in the current income year's tax return) for most depreciating assets costing less than $20,000 that were first acquired on or after 12 May 2015 and first used (or first installed ready for use) for the purpose of producing assessable income on or before 30 June 2019. Assets costing more than the threshold do not qualify for the instant write-off. Instead, those assets are added to a "small business pool" of depreciating assets and their costs are deducted over time (broadly, a 15% deduction in an asset's first year and a 30% deduction in later years, with the balance of the pool written off once it drops below the instant asset write-off threshold). Example 1: a small business tradesperson purchases a ute for $40,000 and estimates that it will be used 40% of the time for business purposes. Even though the income-producing proportion of the asset's cost is below $25,000 (ie 40% x $40,000 = $16,000), the asset does not qualify for the write-off because the full cost is above the threshold. Instead, the $16,000 will be allocated to the tradesperson's small business pool. Example 2: a small business owner purchases a powerful type of computer for $6,800 and estimates that it will be used 80% of the time for business purposes. The asset qualifies for the instant write-off because the entire cost is below the $25,000 threshold. The business owner may immediately deduct the income-producing part of the asset's cost, ie 80% x $6,800 = $5,440. The Productivity Commission's recent report on Australia's superannuation system reveals some concerning weaknesses in the APRA-regulated funds sector – particularly for millions of member accounts in "MySuper" default funds. It also identifies three areas of concern for SMSFs. The report should prompt all Australians to assess whether they currently have the right superannuation arrangements in place for their circumstances. The release of the much-anticipated report comes as Australia debates the merits of raising the compulsory superannuation rate, scheduled to increase from the current rate of 9.5% of workers' earnings to 12% by 2025–2026. Given the size of the industry and the importance of superannuation to our standard of living, a well-functioning superannuation system is vital. Here we outline some of the Commission's key concerns about the current system's performance. While funds have, on average, performed well, the Commission finds there is significant variation in investment performance across funds, leading to poor outcomes for some Australians. Over 5 million member accounts are in funds experiencing "serial underperformance". To illustrate the problem, the Commission notes that a full-time worker, whose superannuation fund is in the bottom quartile, could retire with a balance 54% (or $660,000) lower than if they experienced returns of the top quartile. Concerningly, lack of competitive pressure in the default fund (MySuper) market means poorly performing funds are not being weeded out, creating an "unlucky lottery" for workers who may end up in one of these employer-nominated funds. The Commission is also concerned that many Australians still have multiple superannuation accounts – paying multiple fees and often multiple insurance premiums – and this significantly erodes their savings. In some cases, members are even paying for duplicate income protection insurance policies where they will only ever be eligible to claim on one policy. Access to information and quality of advice is another area of concern. While there is plenty of choice in the market, even financially literate members sometimes struggle to choose a superannuation product that's right for them because it is difficult to access good information. To address these issues, the Commission recommends the following changes, among others: reforming the process of signing members up to default products; more regulatory accountability for providers of default products; and giving consumers easy-to-understand information. What does the report say about SMSFs? Small SMSFs: While large SMSFs perform similarly to APRA-regulated funds, SMSFs with under $500,000 in assets perform "significantly worse", on average. Advice: The Commission identifies a need to improve SMSF advice, and recommends specialist training for persons providing advice to set up an SMSF. Limited recourse borrowing arrangements (LRBAs): Around 7% of SMSFs have an LRBA to purchase an asset. While the low level of borrowing in the sector means there is currently no "material systemic risk", the Commission recommends active monitoring of SMSF borrowing to ensure it does not generate systemic risks in future. The Commission's report highlights the need to ensure you have the best superannuation product in place for your circumstances. Contact us if you have any questions about the report or wish to discuss your superannuation arrangements. The government's new opportunity for "downsizing" Australians to contribute some of the sale proceeds from their home into superannuation may appear to be a very attractive strategy for many individuals who wish to use equity in their home to boost their retirement savings. However, anyone considering this strategy should take into account the full range of consequences, including possible adverse implications for the individual's Age Pension entitlement. Under the new measure, which took effect in July 2018, individuals aged 65 years and over who sell their home may contribute capital proceeds from the sale of up to $300,000 per member as a "downsizer" superannuation contribution. may be made even if the member's total superannuation balance (TSB) exceeds $1.6 million. However, downsizer contributions, once made, will increase the member's TSB. The usual limit on transferring benefits into the tax-free retirement phase also applies. This means that if you have already met your $1.6 million transfer balance cap, any downsizer contribution you make will need to stay in accumulation phase where the earnings will be subject to income tax of 15%. To qualify for downsizer contributions, a member or their spouse must have owned their home for 10 years prior to the sale and the sale must qualify for the CGT main residence exemption, either partially or in full. Despite the name, "downsizer" contributions can be made even if the member does not purchase another replacement property. Additionally, the member must make the downsizer contribution within 90 days of receiving the sale proceeds, and must complete a specific form and provide it to their superannuation fund when, or before, they make the contribution. Members should therefore plan their downsizer contribution carefully. The ATO says that downsizer contributions that are later identified as ineligible will be re-reported as personal contributions, which may result in the member exceeding their non-concessional contributions cap. If you are thinking of selling your home and implementing a "downsizer" contribution, talk to us about whether you will qualify and whether you may require financial advice about this strategy. It is important that this contribution forms part of a long-term retirement plan that covers the relevant taxation, superannuation and Age Pension issues. © Copyright 2019. All rights reserved. Source: Thomson Reuters. IMPORTANT: This communication is factual only and does not constitute financial advice. Please consult a licensed financial planner for advice tailored to your financial circumstances. Brought to you by Robert Goodman Accountants. .